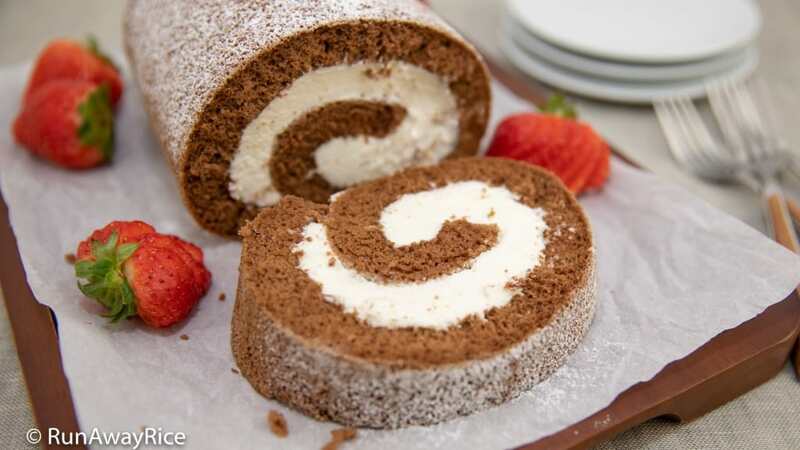 I’ve received lots of requests for this yummy Roll Cake / Swiss Roll / Log Cake (Banh Bong Lan Cuon) recipe after I posted the Sponge Cake recipe. I held off on sharing this Roll Cake recipe until now because I was saving it for the holidays! 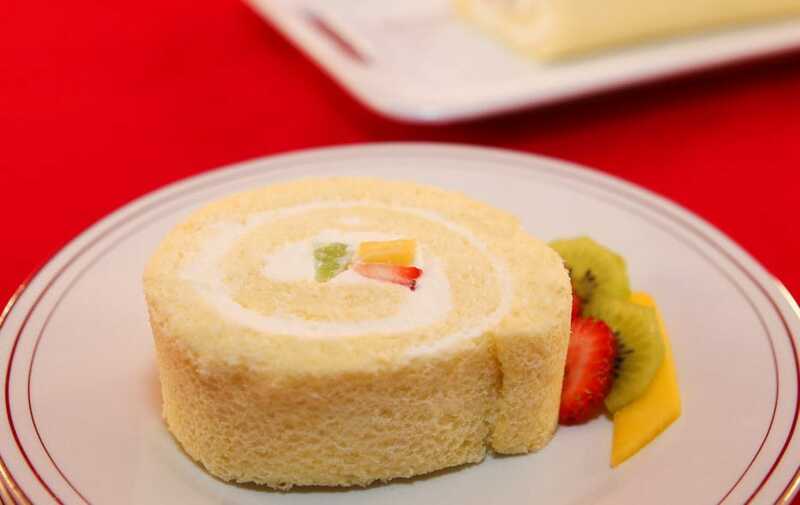 This Roll Cake is elegant and so scrumptious with fluffy sponge cake, swirls of decadent whipped cream frosting and fresh fruit. 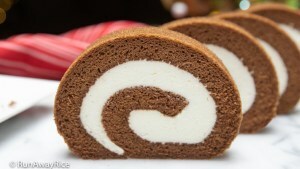 The wonderful thing about this Roll Cake recipe and why it’s my favorite holiday treat is the recipe is so versatile. Using this simple base recipe, you can make many different cake variations. I share some recipe variations below, including my favorite: Mocha Roll Cake. If you’re in the mood to bake something special for the holidays, this is the sweet treat to make for your family and friends. (Thanks all for your patience, especially those readers who sent me multiple emails reminding me to share the recipe…lol.) Enjoy the recipe! I usually make the cake and roll it. While the cake is cooling, I make the frosting and refrigerate. Once the cake is cooled, then I’ll assembly the cake. If the frosting is made hours ahead, remove from the refrigerator about 15 minutes before frosting the cake. It’ll be softer and more spreadable. The gelatin helps to stabilize the whipped cream frosting so it doesn’t lose its shape or melt as quickly as regular whipped cream. The gelatin should be at room temperature and still a liquid when added to the whipped cream. If the gelatin becomes jelly-like or even solid, microwave for 5-10 seconds to return it to a liquid state. Cool again in cold water if needed. 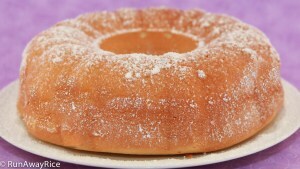 The Roll Cake is baked in a 12 inch by 18 inch baking sheet also called a half sheet pan. Make a small diagonal cut in the parchment paper to help the corners lay flat in the baking sheet. Be sure to spread the batter evenly into the pan and smooth out the top as much as possible. Since the cake is thin and bakes very quickly, there’s not enough time for it to settle and smooth out as with most cakes and so we need to help it along. 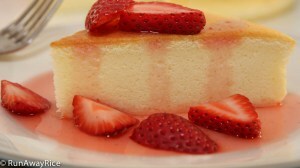 Test the doneness of the cake by using a toothpick and it should come out clean. Another way to test doneness is by touching the cake very lightly with your index finger. The cake should spring back indicating it’s done. Do not over-bake the cake. This will make it dry and it may crack or fall apart when rolled. The amount of frosting to spread on the Roll Cake is up to you. This recipe makes plenty of frosting and you may have some leftover which you can serve on the side. Store the Roll Cake in the refrigerator. Remove from the refrigerator 10-15 minutes before serving. Store in refrigerator for up to 1 week. Freeze for up to 2 months. Place the mixing bowl and whisk in the refrigerator and chill for 20 minutes. Add the water into a cup. Sprinkle the gelatin over the water and let stand for 1 minute. Stir until combined. Microwave on High for 30 seconds. Remove from the microwave and stir making sure gelatin powder is dissolved. Place the cup in cold water and allow to cool to room temperature, approximately 6-8 minutes. Mix the heavy whipping cream on Medium speed until soft peaks form (approximately 4-5 minutes). Add the powdered sugar and mix together for 1 minute. (Cream should start getting stiff.) Scrape around the bowl with a spatula and work in any unmixed powdered sugar. Add the cooled gelatin and mix on Medium High speed for 30 seconds. Increase the speed to High and mix for another 1 minute or until frosting is stiff. Do not over-beat. Transfer the frosting to a bowl and refrigerate. Line a 12 inch by 18 inch baking sheet with parchment paper. Preheat the oven to 350 F (177 C). Prepare the cake batter according to Sponge Cake recipe. Spread the batter into the baking sheet making sure to distribute the batter evenly. Smooth out the batter with a spatula. Remove the cake from the oven. Gently pull the parchment from the sides of the cake. Allow to cool for 5 minutes. Lay a clean kitchen towel on the counter. Dust the towel lightly with powdered sugar. Place the cake on the towel. Trim the edges of the cake if they are uneven. Fold the parchment paper under and roll away from the cake, transferring the cake onto the towel. Sprinkle the top of the cake with more powdered sugar. Gently roll the towel and cake into a spiral. Allow the cake to cool for 1 hour with the seam side down. Cut the fresh fruit into thin slices. Gently unroll the cake. Spread the frosting on the cake. Add rows of strawberries, kiwis and mango slices. Roll the cake back up again. Trim the ends and dust the cake with more powdered sugar. Chill the cake until it’s time to serve. Serve the Roll Cake with any remaining frosting and fresh fruit. Store the cake in the refrigerator for up to 1 week. Mocha: Add 1 Tbsp instant coffee, 1 Tbsp cocoa powder and 1/4 tsp baking soda to dry ingredients and sift together. Coffee: Add 1-2 Tbsp instant coffee, 1 Tbsp instant creamer powder and 1/4 tsp baking soda to dry ingredients and sift together. Chocolate: Add 2 Tbsp cocoa powder and 1/4 tsp baking soda to dry ingredients and sift together. Spice Cake: Add 1/4 tsp salt, 1 tsp cinnamon, 1/4 tsp nutmeg, 1/4 tsp allspice and 1 cup chopped pecans. Replace the vanilla extract with rum or orange extract. Chocolate Roll Cake with Coconut Whipped Cream Frosting: see Chocolate above. Add 1 cup coconut flakes to the frosting and combine well. If using sweetened coconut flakes, you may want to reduce the amount of powdered sugar so it’s not too sweet. Pandan: Add 1/2 tsp Pandan extract to the cake batter (this is before folding in the whipped egg whites) and combine well. 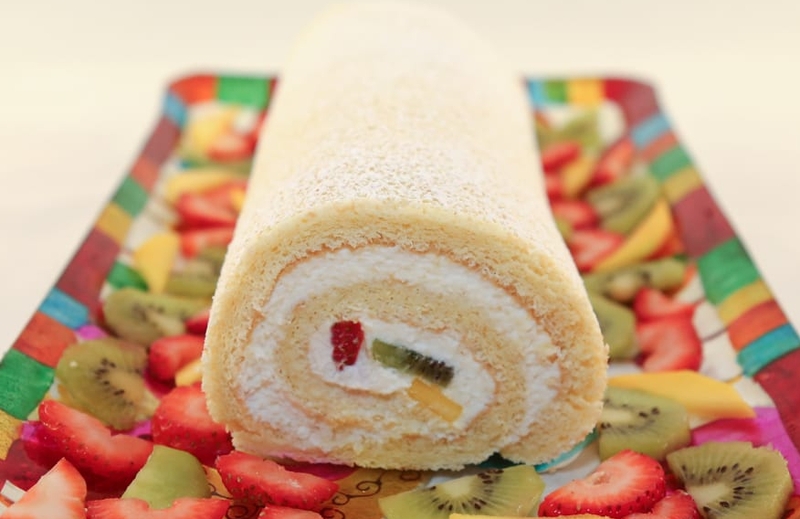 Dress up the Roll Cake by adding fresh fruit, chocolate shavings or dusting with cocoa powder. Drizzle melted chocolate on top for an even decadent sweet treat. Hi, how does the surface of the cake feel like? Does it leave a few tiny crumbs on your hand if you hold it before you dust icing sugar on it? Yes, it should have just a small amount of crumbs. What size is your baking pan? Whoops sorry. I didn’t read the post carefully. But another question: I made the roll cake and it tasted delicious, but I had a difficult time unrolling it after letting it sit for 1 hour. The top was a moist so it stuck to the kitchen towel and resulted in cracks. Any advice would be greatly appreciated. Try using a lighter-weight kitchen towel and this will allow the hot air from the cake to escape faster. 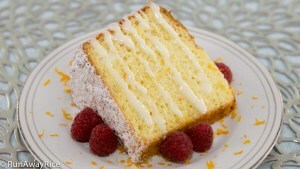 A thicker kitchen towel often holds onto the moisture and makes the cake a bit wet. Instead of a kitchen towel, you can also use parchment paper. This has a nice, non-stick surface. I hope that helps! My pan is approximately 12 inches X 18 inches. At end of this video, you mention the food for the lunar new year. May I have a link or name of it Thanks. This is my first attempt to make swiss roll and I tried it today and it turned out well. Thank you. Am so excited. I followed the recipe exactly, except the frosting, i use buttercream and i use a parchment paper (dusted with icing sugar) to roll the cake. Mine looks just or almost look like yours.Observed the cake still sticks to the parchment paper. The surface of the cake is a bit sticky. Do you know why or is it normal? Am waiting for my food critics (kids) to come back from school to know their opinion. Anyway, I am so happy. Thank you. My both food critics love the cake. My son said ” wow, the cake taste so good” then he continued “probably it’s because am very hungry right now”. I still take it as a compliment. Thank you. I will be making this again and use a kitchen towel this time. Thank you again. I am glad your kids enjoyed the cake, hungry as they were..lol! For a mocha frosting, use Add 1 Tbsp instant coffee + 1 Tbsp cocoa powder. Good Luck and let me know how it turns out for you! I’ll let you know later. Hello! Is there any other substitutes for gelatin? Does agar agar work? As I mentioned earlier you can substitute konnyaku powder for gelatin in equal amounts. I have not tried agar agar in this recipe. Some things to keep in mind, agar agar needs to be boiled for at least 5 minutes to activate the gelling agent. Of course, you’ll want to let the mixture cool before adding to the whipping cream. Agar Agar is stronger than gelatin so you’ll want to use just half the amount in this recipe. Good Luck and please feel free to share your results! Heavy whipping cream has more fat and therefore will be thicker and fluffier than regular whipping cream but will be just fine for this recipe. Just don’t use half and half. Good luck! How much is in each packet of gelatin powder? I have a big bottle and like to know the amount required. Thanks. The packet of gelatine powder I use is .25 oz, approximately 1 3/4 tsp.